Is Linn Energy LLC a Cheap Stock? The lure of its high dividend yield is not a free lunch. Linn Energy (NASDAQOTH:LINEQ) is an upstream energy company in the U.S. that began operation in 2003. It is structured as an MLP and is required to pay out most of its cash as dividends.. Its shares took a hit after the drastic decline in oil price during the second half of 2014. In response to falling profitability, the company slashed its dividend by almost 60%, from 24 cents per month to 10 cents per month. Despite all this, the stock is still yielding 11%, which is attractive to many investors. But looks can be deceiving, let's take a deeper look at its financials to see if the company is cheap enough to buy for the yield, or if the risks associated with this stock suggest you stay away..
First quarter revenue in 2015 actually rose quarter over quarter from $734 million to $917 million. The TTM revenue also increased to $5.17 billion, slightly higher than 2014's revenue of $4.98 billion. This may lead you to think that the company is still growing despite the downturn in commodity prices. A closer look reveals that the average prices realized decreased across the board for all revenue streams (natural gas, oil, and natural gas liquids), and it is gains from derivatives that are driving this sales growth. Almost half of the revenue comprises of gains from derivatives! While the company is thoroughly hedged up until 2017, the derivative gains will eventually run out. This means that the current level of revenue is not sustainable in the long run without some drastic recovery in commodity prices in the next couple of years. . The balance sheet is also troublesome. Over the past few years, the company drastically increased its leverage to purchase and develop additional properties, ballooning its debt to $10 billion today. While there are no significant payments until 2019, the company's profitability is crippled by interest payments. If we were to normalize its operating cash flows and remove the impact of derivatives, net cash to shareholders would be close to zero. This suggests that the company would have to suspend its dividend payments if it is unable to realize prices similar to those it has been getting with its current hedging portfolio. Of course, the management would never suddenly stop distribution. But dividends must be paid somehow, so where can they find cash? Unsurprisingly, the company had an equity offering in May, raising an estimated $189 million to pay down debt. Usually companies do not use equity financing if the shares are undervalued, as it dilutes the equity interest of current shareholders and hurts future returns. The interesting caveat is that while this is going on, dividends are still being paid. In a sense, this is akin to giving yourself a dollar and patting yourself on the back for a job well done. While the stated rationale behind this equity offering is to lower the cost of debt by closing out an old credit facility and replacing it with a new one, I do not see the necessity of this equity offering if the new creditors are jumping at the opportunity. This move would only make sense if there is insufficient interest from debt investors, and so the company has to turn to equity investors instead. The recent oil recovery could breathe some life into the company. In a presentation given in January, the management performed sensitivity analysis on various inputs. 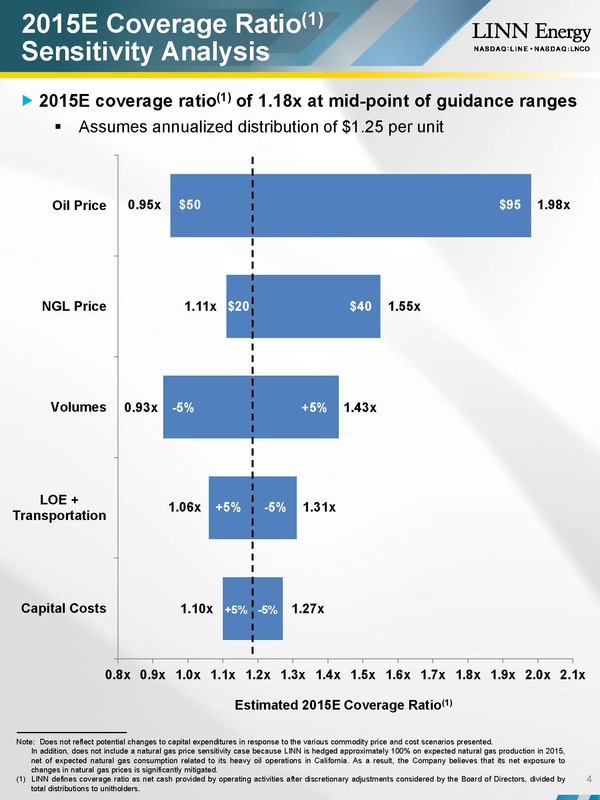 In the chart above, we can see that if oil stays at the current level of around $60/bbl, the company has enough cash from operations to pay dividends. In addition, the management also stated that the company should generate positive cash flow for the full year as capital spending decreases for the rest of 2015. Linn Energy may look cheap with that large yield and sharp drop in share price, but the underlying risks suggest that there is still lots of room to fall. Its inviting dividend yield hides what is really going on. Cash is tight and the management diluted equity interest in an effort to maintain dividend payments. Ultimately the company's equity value depends on the oil price, and it is at best a speculative bet on the future price of the commodity.